The European Cyclists’ Federation (ECF) has unveiled a new tool that allows users to find European Union funding for cyclingrelated projects. ECF research has revealed that up to €2.3 billion of EU funds could be used for cycling-related projects with a minimum of €1.3 billion available during the current seven-year funding cycle, which expires in 2020. 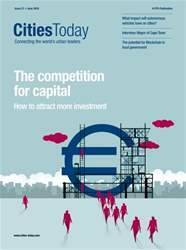 “Cities often don’t realise the opportunities for EU funding,” said Ed Lancaster, Policy Officer, ECF.